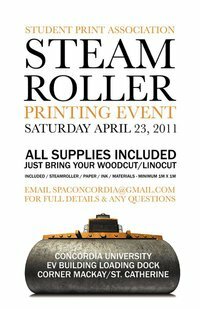 On April 23, 2011, Concordia University is hosting the Steamroller Printing Event, at the corner of Mackay and St. Catherine, in Montreal. 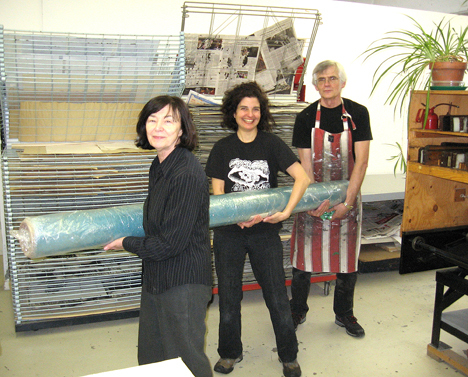 Artists are invited to bring a woodcut or linocut plate, measuring at least 1 meter by 1 meter. 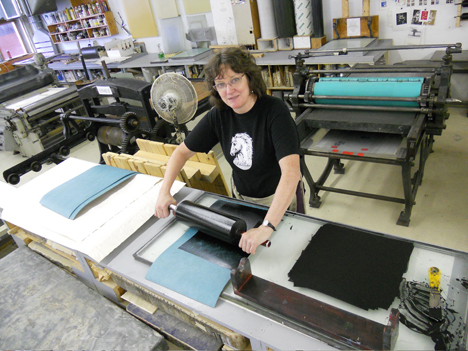 The Student Print Association supplies ink, paper, cleanup supplies and a 48 inch 5600 pound steamroller. 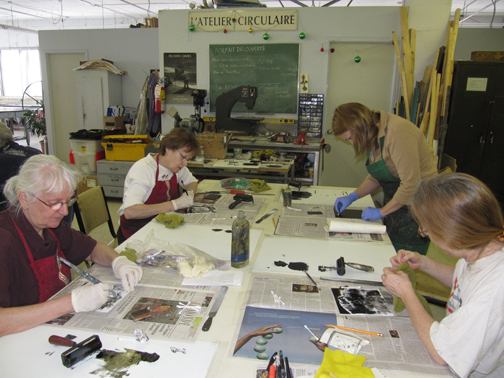 Forty-seven minutes later, René proposed that we form a group of Atelier Circulaire artists and collectively work on a large linoleum plate. This sounded practical and fun. 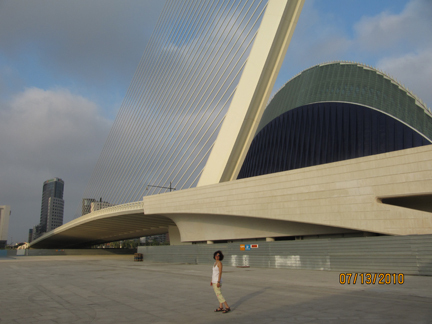 The following day at the studio, we discussed the idea. 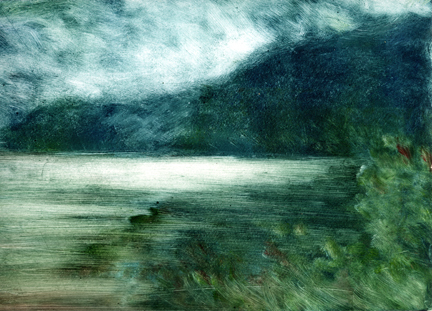 Since René is preparing his upcoming solo show, we agreed that I would organize the project. Over the next few days I recruited four more artists. Our Group of Six includes René Donais, Talleen Hacikyan, Michel Lancelot, Noémie Lesquins, Rolande Pelletier, and Deborah Wood. 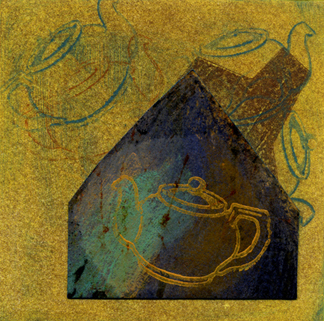 The group met in Atelier Circulaire’s kitchen, around Deborah’s home-baked banana bread and a pot of green tea. Although each artist had their own vision of the project, there were common threads, and through discussion, and with the help of some sketches, our direction became clear. 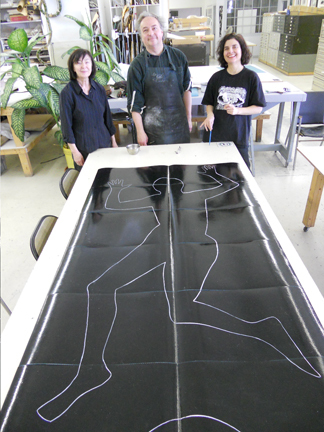 We decided to engrave a 3.5 x 6 foot piece of linoleum, inspired by The Fall of Icarus. We would cut our plate into twelve equal pieces. On the ensemble of these plates we would collectively draw a silhouette representing Icarus. Each artist would engrave on two randomly picked plates, which would then be reassembled and glued to a sheet of plywood. Rolande and I walked through a vigorous March snowstorm to Million Tapis et Tuiles, on the corner of Bernard and St. Laurent. Following the advice of Concoria’s Student Print Association, we shopped for Marmoleum, a linoleum made with 100% natural ingredients: linseed oil, cork, limestone, tree rosin and natural minerals. We located a suitable roll of eco-friendly Marmoleum amidst a forest of linoleum rolls, stacked upright against the back wall, settled on a reasonable price that included tax and extra Marmoleum thrown in for free, and hauled it back to the studio by foot. The group worked efficiently over the next few days. Michel cut the Marmoleum into twelve equal pieces, Deborah rolled black ink onto them to make our engraving more visible. Two days later, when the plates had dried, Rollande, René, Michel and I drew Icarus. I lay down on a large sheet of paper and struck my best Icarus-falling-from-the-sky pose. After adjusting my arms and legs just so, the other artists outlined my body. We refined the drawing and transferred it onto the Marmoleum plates. The final step was to draw names to see who would be engraving which plates. 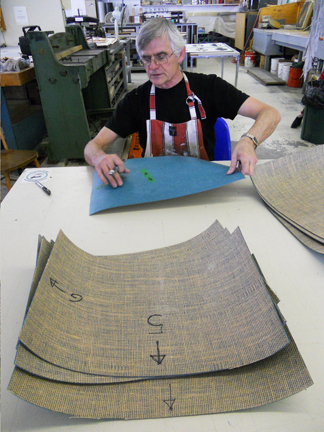 Paule Maingy, our etching coordinator, kindly undertook this all-important task. Now that the plates have been distributed amongst us, let the fun continue! 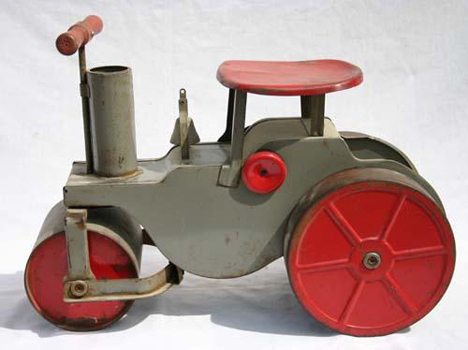 Stay tuned to future blogs on our steamroller print project. Last Friday, my seven-year old niece, Alexia, had a Ped Day. 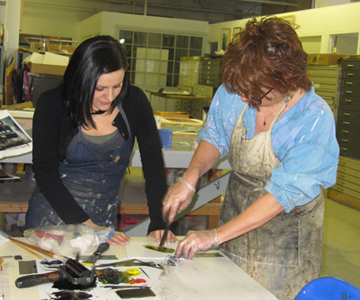 What better way to spend it than experiencing Auntie Talleen’s printmaking pedagogy? 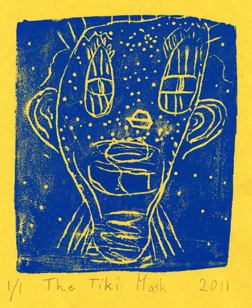 I gave Alexia an extended, private version of the printmaking workshop I do in schools with the program Les Artistes à l’École. For the past 18 years I have been participating in this stimulating program that takes me to elementary and high schools across Quebec to give printmaking workshops. Alexia got a personalized workshop in the comfort of my basement, where our ping pong table regularly doubles as an art table. 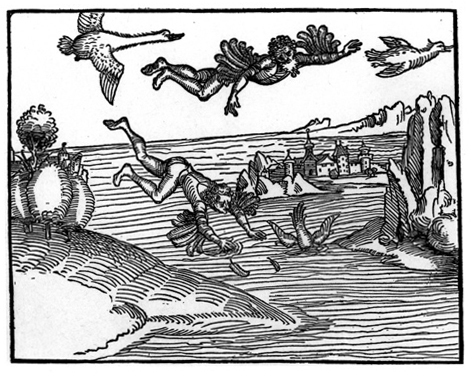 I started out by showing Alexia some of my woodcuts–early prints of underwater scenes. I showed her a carved wood plate and explained the principle of relief printing. 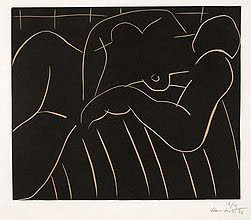 Then I demonstrated how to print a linocut by hand, using the same printing method that she would soon be using herself. I let Alexia choose a theme from the packages of subjects I have developed for students over the years–insects, fish, medieval times, Chinese art, Inuit art, etc. 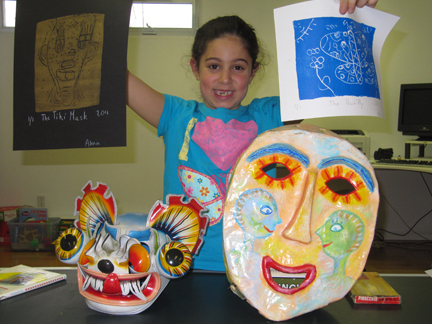 She chose the African mask, one of my favorite subjects to work with during my workshops. We looked at photos of African masks, talked about their symbolism, and what type of ceremonies they are used for. I also showed her some real masks I have at home, including an elaborate metal piece I bought in Bolivia and a mask I made out of papier mâché. 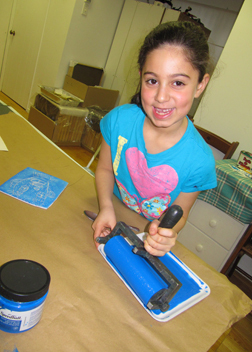 At this point, after pumping up her curiosity, something I learned to do when I studied art education, she was more than ready to try her hand at relief printing. Alexia carved into Styrofoam plates, using a pencil. This simple and direct technique gives wonderful results. 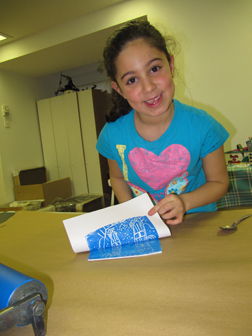 After carving, Alexia inked her plate with a rubber brayer and printed with a spoon. She printed several images, on different colors of paper. 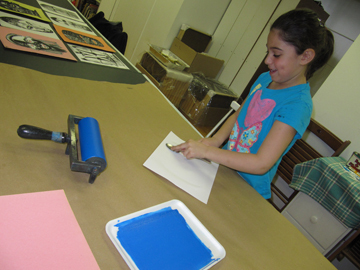 She was so thrilled with the magic of the printing process that she made a second print. 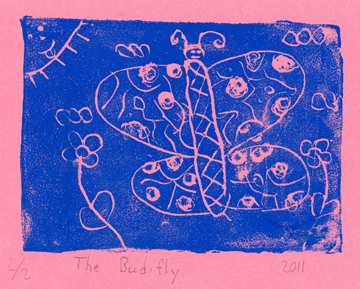 This time she created a butterfly and gave it the ingenious title, The Budifly. I love transmitting my knowledge and passion for art. Working with Alexia has the added bonus that I get to spend quality time with her and share her world for a few hours. She tells me stories of her experiences at school, with friends and family and she knows how to make me laugh, and put an expression on my face that rivals the the most comical of African masks! In the beginning there was….recycled newspaper! 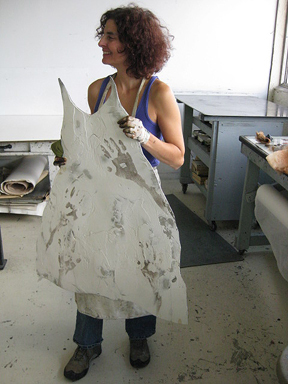 I’m working on a series of papier mâché dresses to complement my series of large format collagraph dresses. I’ve always loved the papier mâché process, from ripping newspapers into strips, to mixing wallpaper paste, to layering my work in progress with wet and dry pieces of paper. There is something soothing, almost meditative, that is intrinsic to the technique. 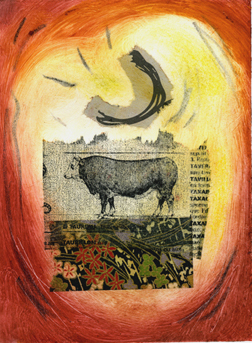 As a printmaker, I have an affinity for paper, in all its forms and expressions. Women wear dresses to work, to dance, to marry, to mourn, to seduce, to celebrate. 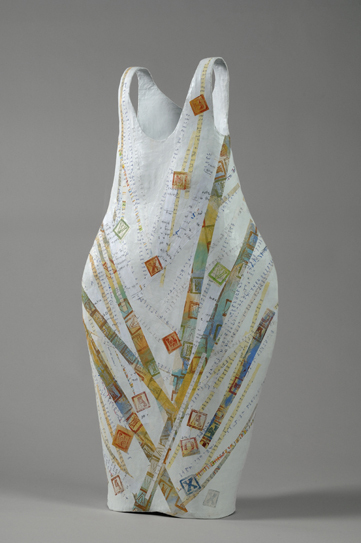 I use the dress in my work as a means of revealing facets of womanhood. I am interested in the interaction between the inner and outer selves. My dresses embody aspects of essential being that women consciously or unconsciously reveal to the outside world. In Building Blocks the sculpted dress-body is covered with shredded strips of my personal journal and strips of Japanese paper printed with children’s blocks. The mumbo-jumbo of indecipherable messages creates a discrepancy between the genuine self and the presented self. Personal reflections become adornment. These pieces explore the act of “dressing up” inner thoughts and desires. 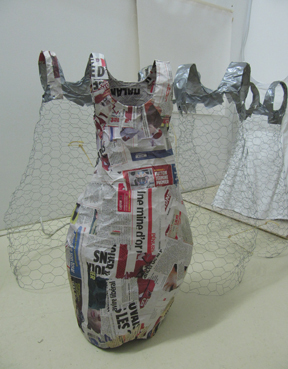 I am presently completing several dress sculptures. This playful yet demanding act is accompanied by another activity that requires its own set of skills–finding a home for my work in a gallery. With each new application in the mail, I have the impression that you, the rest of my dear public and I are getting a step closer to seeing this ensemble of work in a majestic space with prisitne white walls, a beautifully varnished hardwood floor, a shower of natural light and a visionary gallery director who will promote my work! 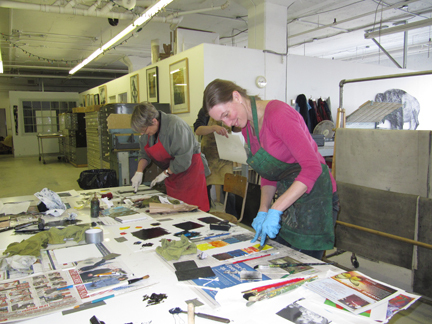 On January 29, I gave an intensive one-day monotype workshop at Atelier Circulaire, the ultimate printshop. Not only is this a great studio to work in but it is a super space to offer a workshop in. Students enjoy working in a professional studio, alongside practicing artists, in a creative, as opposed to academic, atmosphere. I enjoy teaching here not only for the top-notch installations but also because it feels like a second home. This gives me the impression that I am receiving people at my place and contributes to a warm atmosphere in my workshops. I had eight students, from various walks of life, including an accountant, two teachers, a translator, and a couple of artists. 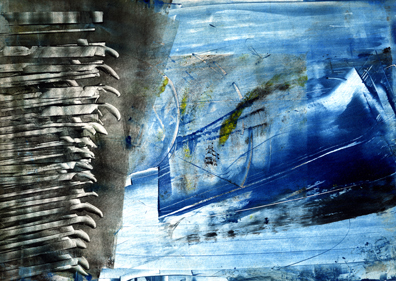 Some people had made monotypes several years ago and wanted to reacquaint themselves with the technique, while picking up a few new tricks. 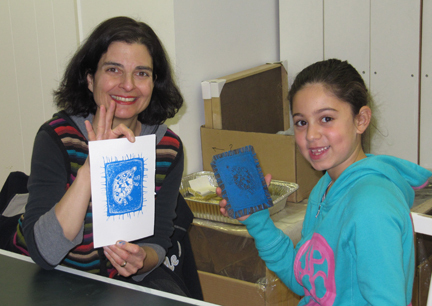 For others, this was their introduction to printmaking. Regardless of level, everyone worked through the various exercises with enthusiasm and an open mind, eager to go with the flow and discover what their plates would reveal. We started with black and white prints, continued with the addition of one color, after which students moved onto larger multi-colored work. 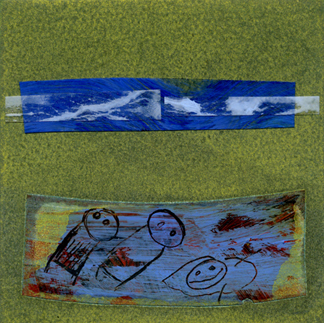 In the afternoon I introduced the encollage method, where one can collage a piece of paper onto the printing paper with the inked plate, through the press. I had a selection of printed Japanese papers that students could incorporate into their monotypes. Students had also brought other paper elements for encollage, such as children’s drawings, marbled paper, and photocopies. I also demonstrated of how to make a trace print by hand, with water based inks, a non toxic technique that students can explore at home. Students spent the last hour free to experiment and combine all the above mentioned techniques. 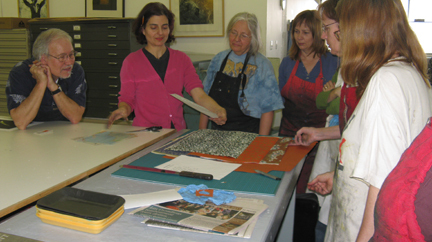 Before placing prints to dry between boards, we looked at everyone’s monotypes and exchanged impressions. 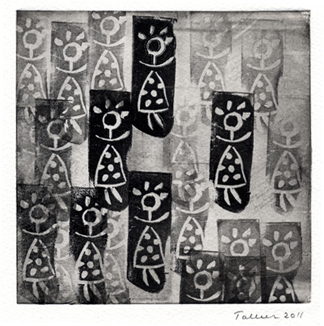 Since the two monotype workshops I gave in January, two students are applying for Atelier Circulaire’s forfait découvert (a three month membership offered at a reduced rate), and several others are coming on “taille douce” Fridays. On these days, artists can make arrangements to work and print at the studio, on their own, under the supervision of printer, Paule Mainguy. When I see former students pursuing techniques that they learn from me, I have proof of mission accomplished. 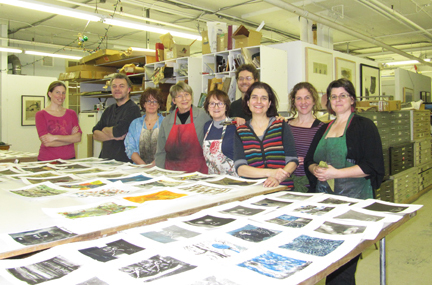 On Saturday January 22, I gave a one-day intensive monotype workshop to eight students at Atelier Circulaire. 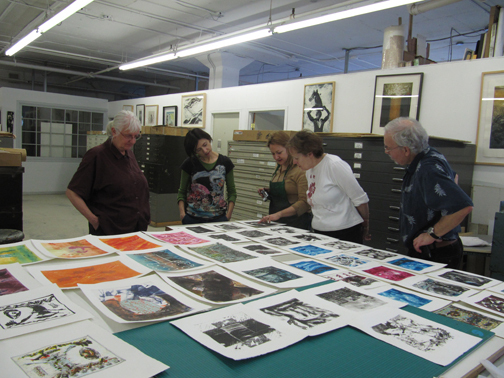 The group included two teachers, two graphic designers, a framer, and three artists. 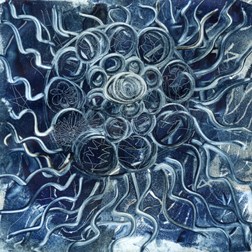 Five of them were in my collagraph class in November, the two artists from Atelier Circulaire had already taken workshops with me, and in the case of one teacher, I had recently given a monotype workshop to her high school art students. 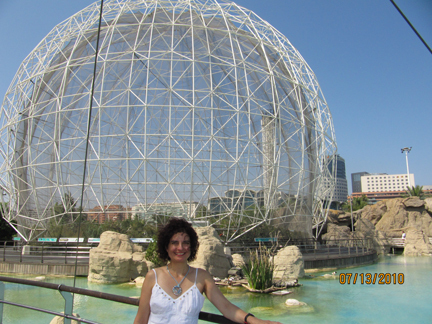 The atmosphere was friendly and stimulating. I usually give my workshops alone. This time I worked with an assistant professor, Lisette Yoselevitz. Lizette graduated last year from UQAM’s Fine Arts department and is a member of Atelier Circulaire. 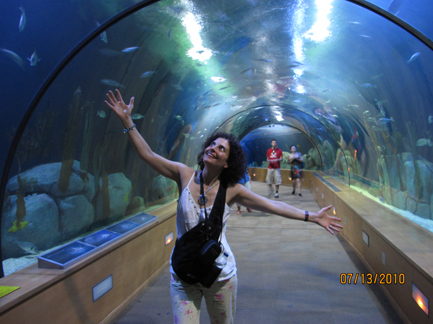 She has given several art classes in Mexico and is presently offering piñata and alebrije workshops in Montreal. It was a true pleasure and luxury to work with her. 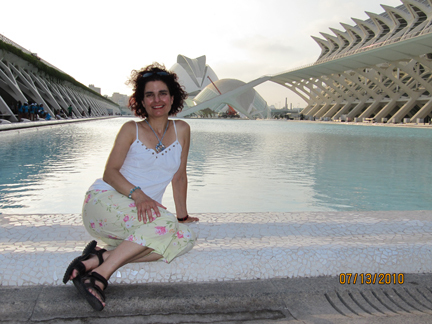 Lisette is efficient, motivated, supportive to students, and full of positive energy, a perfect complement to my teaching. The pace of the workshop was steady. I offered a flow of information at regular intervals to allow students to integrate different approaches to the traditional monotype. It is a challenge to decide how much to cover in one day. On the one hand I want students to experience a range of possibilities and on the other I want them to feel relaxed as they experiment the various techniques. The advantage of working in a group is that students benefit from each other’s results. It is always exciting when they share their newly acquired skills. After a morning of rolling, wiping, smearing, painting, stamping, and Q-tipping ink on styrene plates and printing them onto paper through the printing press, students were ready for a well-deserved lunch break. In typical Atelier Circulaire manner, we chatted, ate and drank around the black slate kitchen table. As if by magic, items for sharing appeared before us: an assortment of heavenly teas, a bowl of cookies, blueberries and a bottle of wine. In the afternoon I showed the class how to combine the monotype with the encollage of drawings, digital and printed images and Japanese papers. I was pleased to see a full range of pieces, each distinct in style. This was followed by an exhibition of the day’s work accompanied by a friendly round of feedback. Before saying our goodbyes, I demonstrated how to hand print a trace monotype with water based inks, a non-toxic technique that can easily be done at home. 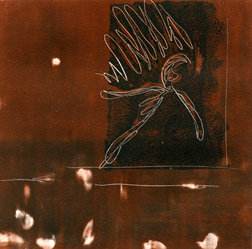 Because monotype is a direct, spontaneous and relatively rapid printmaking technique, it is suitable for a one-day workshop. However, because it is so open to experimentation, and because it produces such a rich range of effects, it also deserves to be further explored and developed through time. 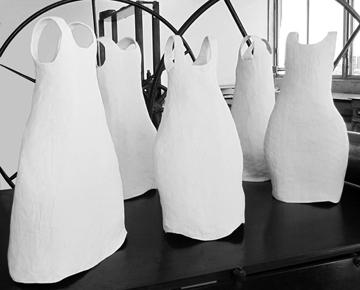 At Atelier Circulaire, students have the possibility of working in the studio on Fridays. This can be arranged by appointment, for a fee of twenty-five dollars. My greatest joy is seeing former students perfecting techniques that I have taught them. 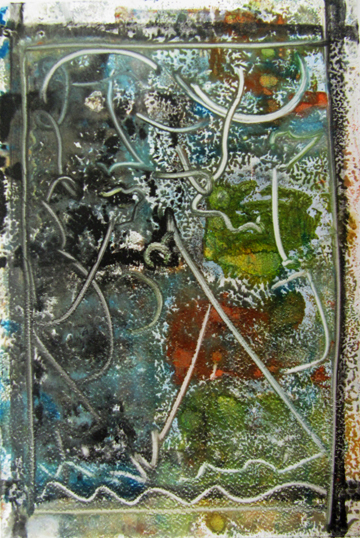 On January 22 and 29, 2011, I will be giving one-day monotype workshops at Atelier Circulaire, in Montreal. 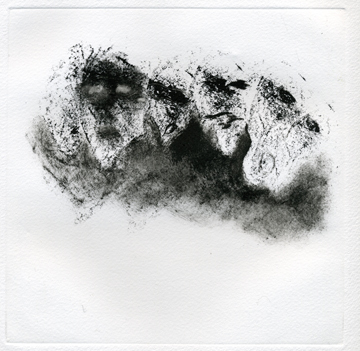 Monotypes are printed drawings or paintings. An image is drawn or painted directly onto a plate, with printer’s ink, oil paint or water-based paint and transferred onto paper through a press or by hand. The plates may be metal, plastic, glass, wood, lithographic stone, or made of any material that will transfer an image. 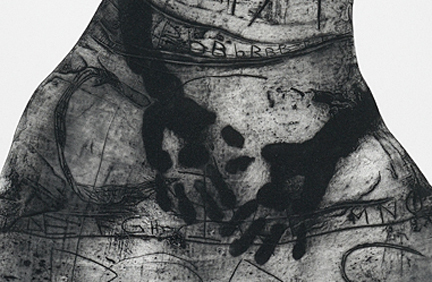 Whereas traditional printmaking techniques such as woodcut, etching, or lithography, require the carving or chemical fixing of a design in a plate so that the image can be repeatedly inked and printed, monotype does not. 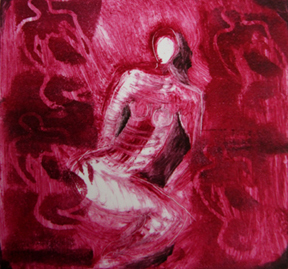 This process is meant to yield just one (“mono”) print. 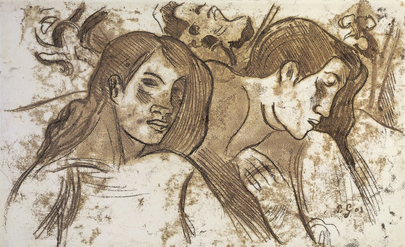 It is hard to pinpoint the origins of monotype, however, artists probably used variations of the technique as early as the first intaglio prints of the fifteenth century. 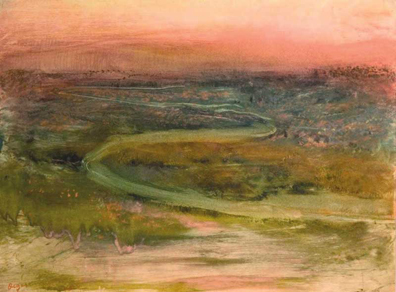 A strong interest in monotypes developed in 1968 when Harvard’s Fogg Art Museum exhibited seventy-nine monotypes by Edgar Degas. Many important artists such as Blake, Picasso, Gaugin, Pisarro, Matisse and Chagall have expressed themselves in monotype. 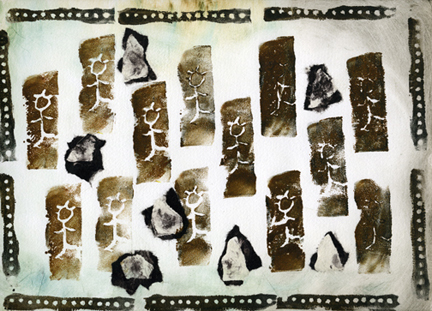 Technically speaking, the monotype is the simplest form of printmaking. It lends itself to spontaneous and experimental image making. 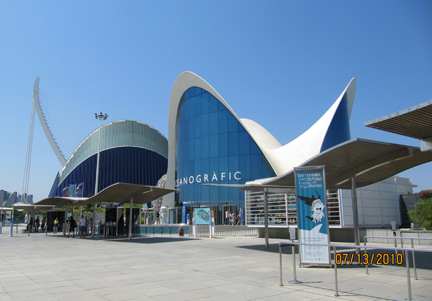 Subject matter and treatment, however, can range from traditional to experimental. I love teaching monotype. Students feel free to try new approaches and enjoy discovering novel effects. 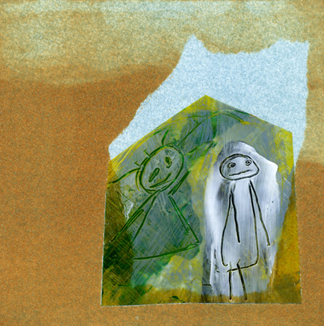 An atmosphere play takes over the studio as students, brush, wipe, scratch, roll, or stamp designs onto Styrene (plastic) plates. And invariably oohs and ahs echo as prints get lifted from their plates at the press. Since I try to show many approaches to monotype in six hours, I lead a very structured workshop, where each stage leads naturally and logically into the following. 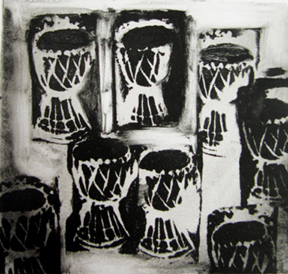 In the morning students start experimenting texture and design by making black and white prints. By the end of the afternoon, they are creating colored prints that incorporate the encollage of fine Japanese paper and other printed elements. 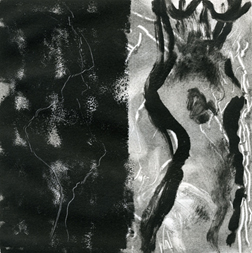 Over the past couple of weeks I have been in monotype mode, playing at the press, experimenting with different techniques, inks, papers, and plates. It was great joy to get my hands dirty, yet another time. Now I’m trying different emollient oils and creams to rejuvenate my eternally dry hands. I even tried bear oil! Twenty-five plus years of printmaking takes a toll on hand maintenance. Tonight I start using glycerine, a convenient substance since I always have a bottle handy, to mix into the water-based ink that I use for hand printed monotypes! 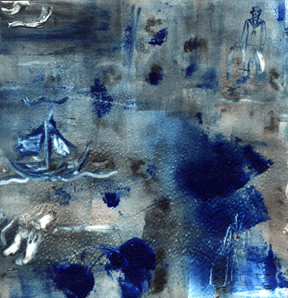 All images in this blog are monotypes. Atelier Circulaire is presenting Prêt-à-Emporter V, its annual Christmas exhibition-sale at La Galerie Circulaire, in Montreal. 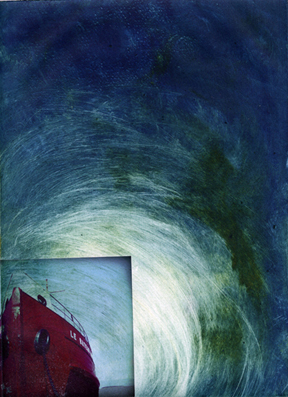 The vernissage is on Friday December 3, 2010, from 6:00 to 9:00 pm and the exhibition continues until December 18. This event, which is being held for the fifth consecutive year, is a fundraiser for Atelier Circulaire. All prints are listed at 100$ or less, making it a unique opportunity to acquire an original print at a very reasonable price. 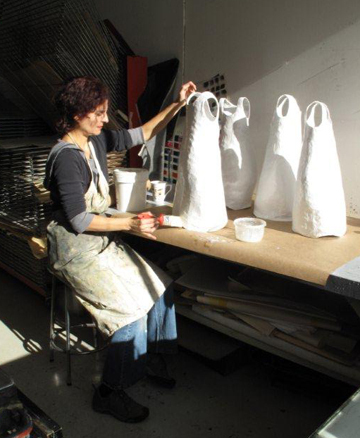 Artists donate 50% of earnings to the atelier. Prêt-à-Emporter draws a huge crowd of print collectors, young professionals purchasing art for the first time, and Atelier Circulaire groupies, including artists, students and friends of friends of friends. For the occasion, the Circulaire Gallery walls are adorned, ceiling to floor, with a wide variety of prints by atelier members, as well as non-member artists. There is a definitely festive mood in the air on the night of the opening. After a stop at the gallery on the rez-de-chaussée, the public is invited to the studio on the fifth floor, for drinks, hors d’oeuvres, live music, and the chance to mingle with artists. 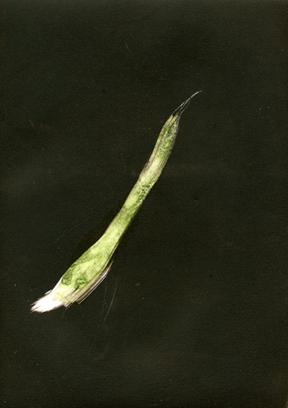 This year I am presenting five monotypes. 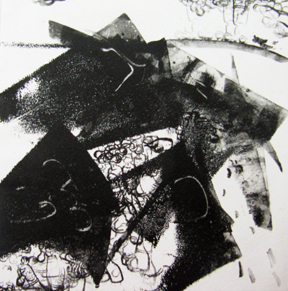 As the word suggests, monotypes are one-of-a-kind prints. In this series the theme focuses on home and snapshots of domestic rituals such as a pot of tea, brewing a nostalgic sense of security. After twenty-five years at the etching press each printing session still captivates me. There is something reassuring about repeating the gestures that have been handed down to me through generations of master printers. 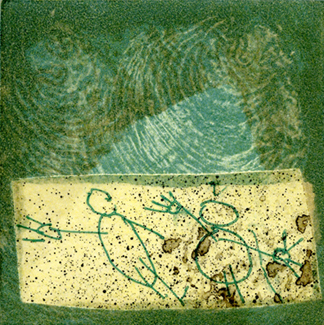 I learned the fine art and craft of intaglio printing from François-Xavier Marange, maître taille-doucier, master printer. 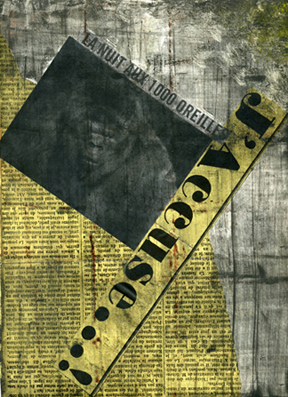 François-Xavier, born in France, printed at Ateliers Leblanc, Lacourière-Frélaut and Maeght, in Paris, and printed for many great names such as Friedlander, Lam, Miró, Tapiès, and Zao Wou-Ki. 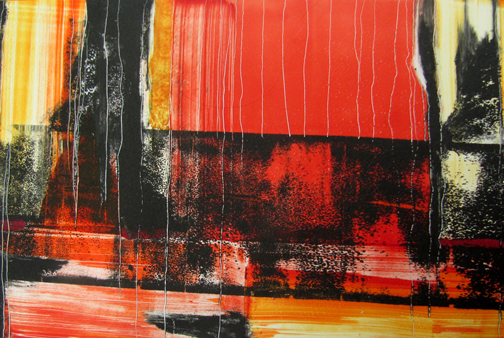 He is responsible for introducing the traditional method of intaglio printing to Atelier Circulaire in Montreal. He injected a passion for the métier that touched all the artists who worked with him, including myself. Through the years I have also had the chance to print with many other master printers, including Luc Guérin, Pierre Colin, and Alain Piroir, all from France. The printing session is a ritual. Each gesture is performed a certain way, and the body memorizes these movements, which over time become as natural as walking. At the press, especially when printing a large edition, this automatism contributes to smooth, technically sound and fast work. 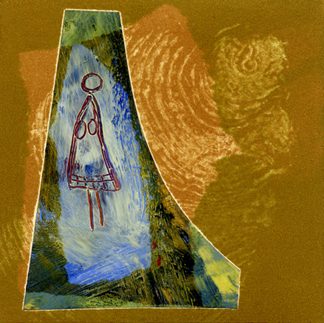 Since spring I have been working on a series of large format collagraph prints on the theme of the dress. 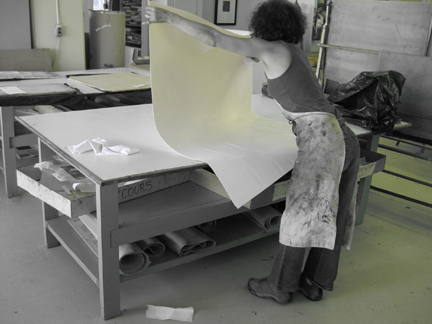 Printing large works is challenging, physically exhausting and expensive. They can also be gratifying to create and powerful to look at. Every couple of years I have to indulge in my desire to go big. There is something sensual and inviting about attacking the large cardboard plates that I use to print with. In the case of my dresses I wanted to make slightly larger than life-size robes that conjure real bodies, or rather the absence of them. When working big I am physically drawn to my plate in a way that cannot happen when working on a smaller scale. For this series I printed parts of my body directly onto my dress plate to make textural imprints, traces of myself, of actual moments that in the context of my artwork take on the role of fictive dramas that play in the viewers’s imagination–adult footprints running toward an empty womb, reaching arms within a female torso, a naked torso emerging from floral lace. When I print test proofs of my cardboard plates, the intuitive work that went into creating my plate is brought under the objective scrutiny of my eyes as I examine what my proof reveals to me. These prints are like compasses. They direct me and tell me how to intervene on my plate in order to improve and eventually perfect my print. 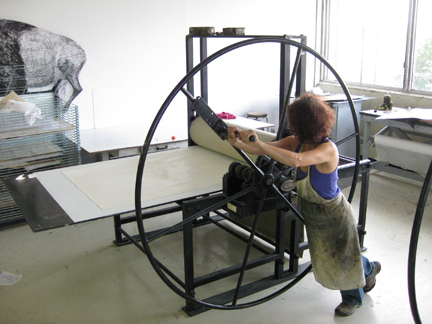 The Hurel 1, that I use to print my dress collagraphs with, was designed by François Xavier. This Cadillac of a press can work magic, however, everything is exaggerated when printing on this monstrous scale. 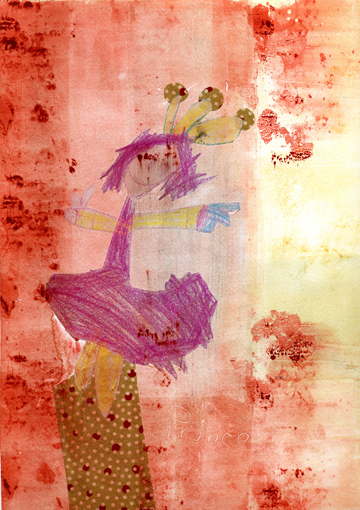 Ordinarily simple tasks such as cutting, wetting, brushing and placing paper become a dance. Turning the press turns into a grueling workout at the gym! At the end of my printing session, I wipe my ink off the glass table with vegetable oil and a good dose of elbow grease. 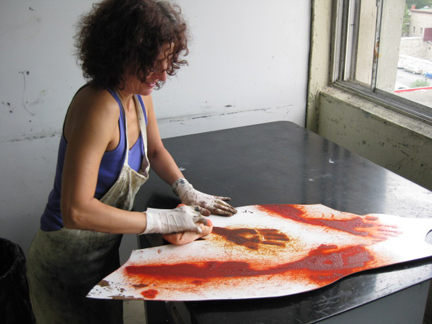 No one I know likes this step, but the body complies with this duty that has to be performed meticulously in order to maintain peace with fellow artists at this community printmaking studio. 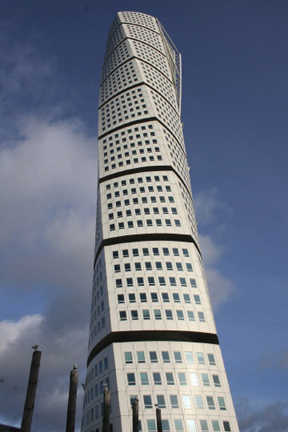 The upside is that while cleaning I can admire the view from our panoramic windows. 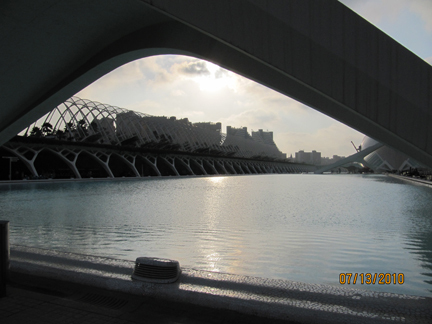 The setting sun becomes a metaphor for continuity. 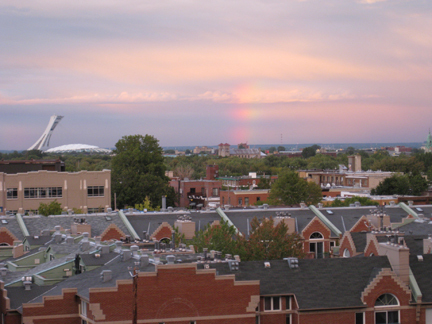 There is something reassuring about this natural phenomenon. It makes me feel harmonious and alive, which is how I feel when I turn the press. 24 requêtes. 0, 098 secondes.